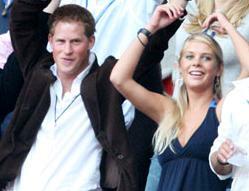 Chelsy Davy, the girlfriend of Prince Harry, has decided to study at Leeds University to be closer to her boyfriend. The 21-year-old Zimbawean beauty has applied for a post-graduate degree course at the West Yorkshire University. However, the decision has a obstacle to hurdle because Chelsy doesn’t like the cold and wet weather of the UK. Prince William: Set To Get Engaged With Kate Middleton Soon?